Our clinic is located in Battersea, in-between the Clapham Common and the Wandsworth Common. This area is also called “the Nappey Valley” due to his density of young families. Which is great as we are a family-run practice and treat all age’s patients: babies, children, adolescents, parents and grandparents! 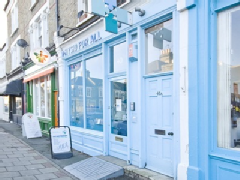 Physio for All in Battersea is situated at 40 Webbs road SW11 6SF on the corner of Bramfield Road and Kelmscott Road. Webbs Road runs parallel to Northcote Road. Easily accessed by train, tube or Buses. For the best route look at the journey finder on the Transport for London website . Train/Tube: The nearest railway station is Clapham Junction (approx.10 min walk).The nearest underground station is Clapham South (20 min walk). -Bus 337- Clapham, Wandsworth, Putney, East Sheen, Richmond.